John Wayne is not exactly someone I would picture cooking or even entering the kitchen, but this recipe actually looks pretty good. 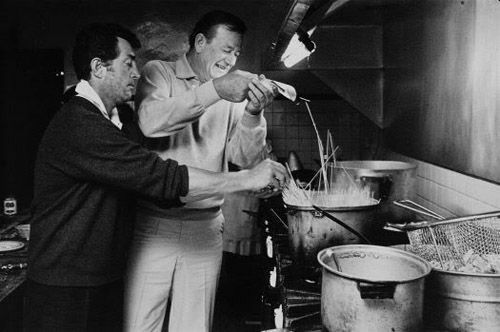 If John Wayne says it is good enough to eat, then you damn well better sit down and eat! Combine chilies with cheese in a large bowl and turn into a well-buttered shallow 2-quart casserole dish. Beat the egg whites until peaks form. Mix egg yolks, milk, flour, salt, and pepper in a small bowl. Fold egg yolk mixture into the egg whites. Pour over the cheese and chili mixture. Comb through with a knife and fork gently until combined. Bake for 30 minutes. Arrange tomatoes on top, and bake another 30 minutes. Garnish with extra chilies, if desired. Let sit 15 minutes before serving. 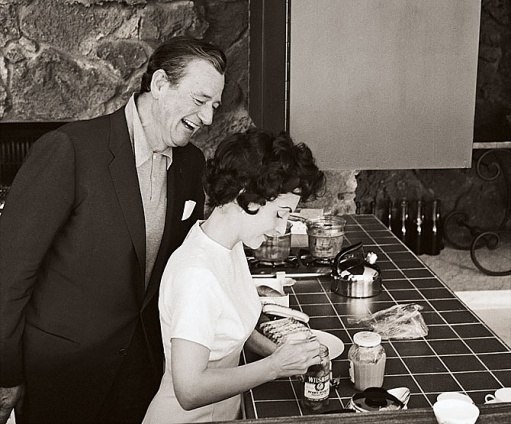 In the movie "Tall in the Saddle" the Duke bakes biscuits in one scene and looks totally comfortable. I bet biscuits would go great with this casserole. Interesting omission for a man like the Duke...no meat.